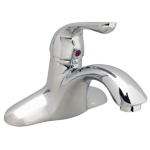 The faucet is the centerpiece of a beautiful and functional kitchen or bathroom. With drip-free performance, tough finishes to resist scratching and tarnishing and hundreds of styles to choose from, our faucets from Wolverine Brass can help turn your kitchen or bath into a show piece. There’s really no space in your home more utilitarian than the kitchen sink, but with the right faucet, this supremely practical spot could be a beautiful focal point. If you have a sink with 1 hole, you can choose between either a single handle faucet or a single handle faucet with a deckplate. If you have a sink with 2 holes, you can choose between either a single handle with an accessory (like a sprayer or soap dispenser) or a double-handle faucet. If you have a sink with 3 holes, your options increase. You can choose between a single handle with a deckplate, a faucet with two accessories (like a detached handle, soap dispenser, or sprayer), or a double-handle faucet with one accessory. If you have a sink with 4 holes, you can choose between a single handle with a deckplate, a single handle with three accessories, or a double handle with one accessory. Next, figure out what type of faucet will work best for you. Do you prefer two separate handles? A pull-out sprayer? Long or short spout? And Finally, a finish to complement the sink, countertops and door hardware. In any bathroom overhaul, the faucets are the crown jewels. Available in a spectacular array of shapes and finishes, even modestly priced faucets present worlds of possibility. Add in the options for interactivity and water conservation, and today's bathroom faucets offer homeowners every convenience.